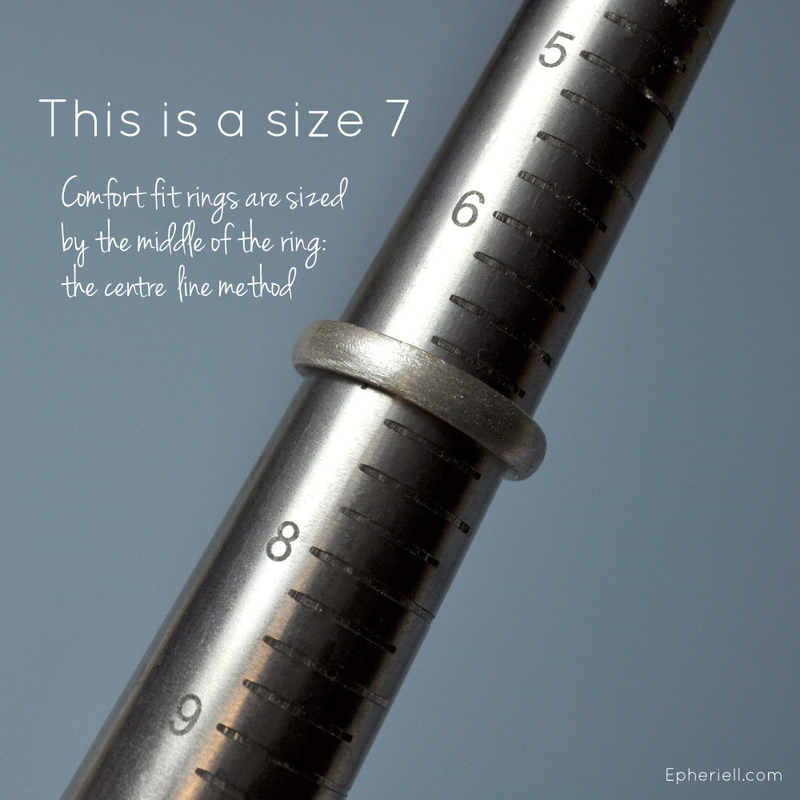 Sizing rings can be a tricky business – especially when working across the internet. Why is it tricky? Because every jeweller does things ‘their way’ – and those ways don’t always line up, jeweller-to-jeweller. Firstly, there are a ton of different ring measuring systems depending on where you live. Thankfully, there are handy charts like this one that allow jewellers like myself to convert from one system to another. It’s for this reason that I recommend that all my customers go to a couple of different local jewellers to get their ring size. If you can get 2 different jewellers who agree on your size, you can be pretty confident that it’s the right one! Any other method – like using an online sizer, one you print out, or even a bit of string or tape around your finger are never going to get you an accurate size. The only way to be sure you’re getting the right size is to have a jeweller professionally size you in-person. Thankfully, any jewellery store will do this for free, and it takes just one or two minutes. It’s definitely worth the effort in the long run to get the size right, first time! Size differs depending on the width of the ring you order, too. 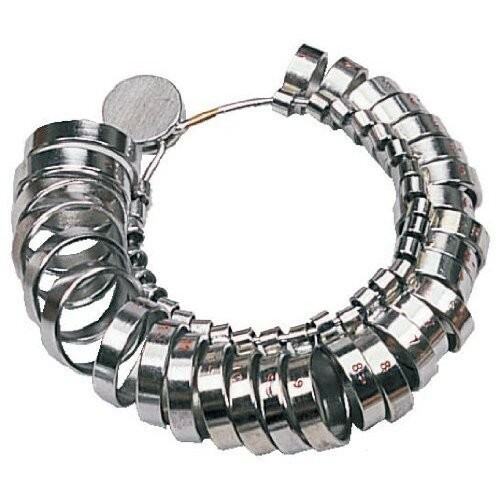 Jewellers can use either a thin or a wide set of sizing bands. Why? 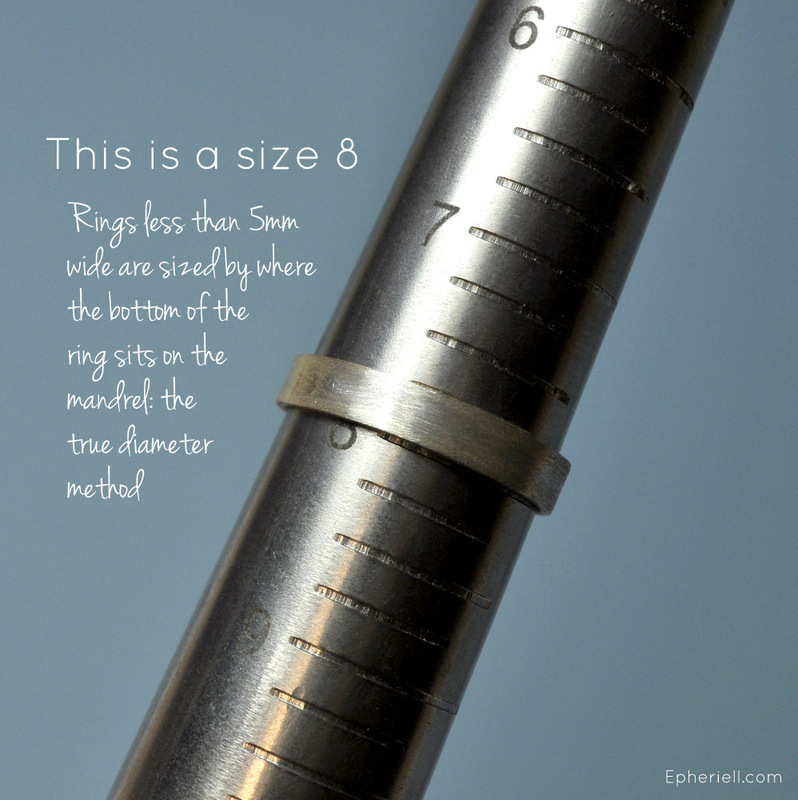 Because the width of your ring affects the fit. Wider rings need to be larger than narrow ones to feel comfortable. 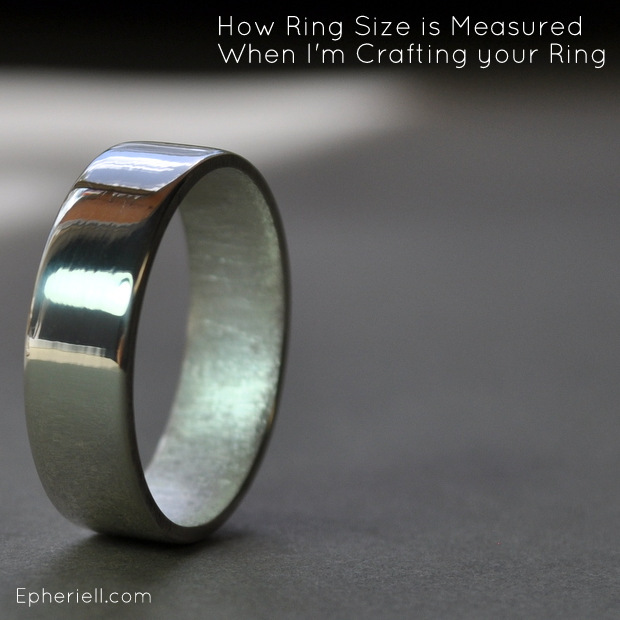 It’s for this reason that I always make any ring larger than 5mm between 1/8 and 1/4 size bigger, depending on the info you give me about how you got sized. 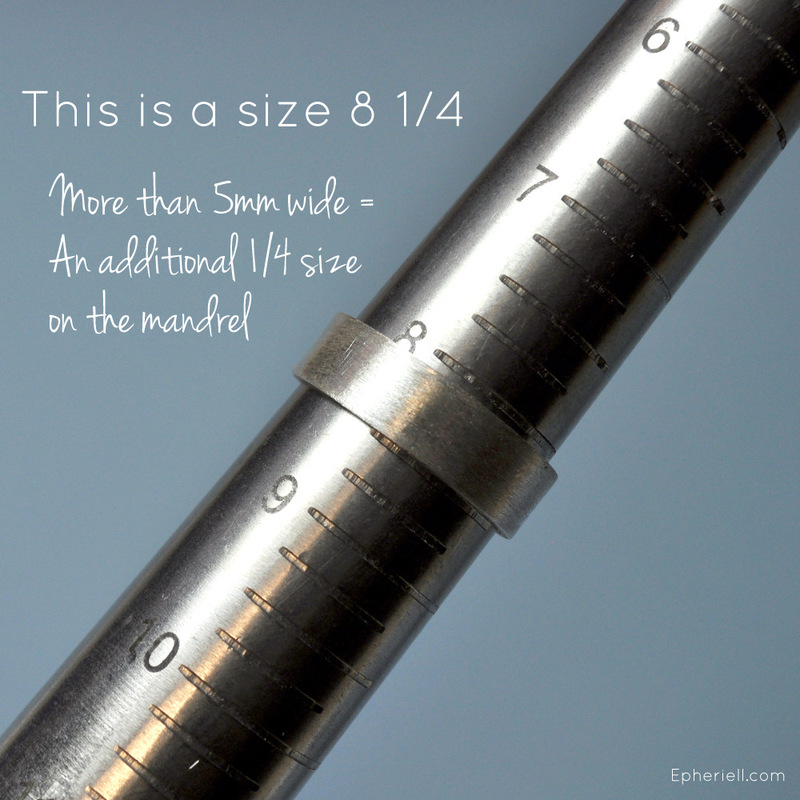 There are also 2 different methods for sizing rings depending on where they sit on the jeweller’s mandrel (I KNOW, it’s crazy!). The first one is the centre line method. 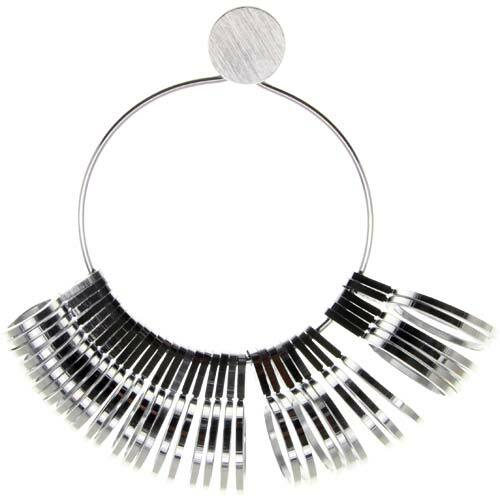 Using this method, the size is read depending on where the middle of the ring sits on the mandrel. The second one is the true diameter method. This is read by where the bottom of the ring sits on the mandrel. 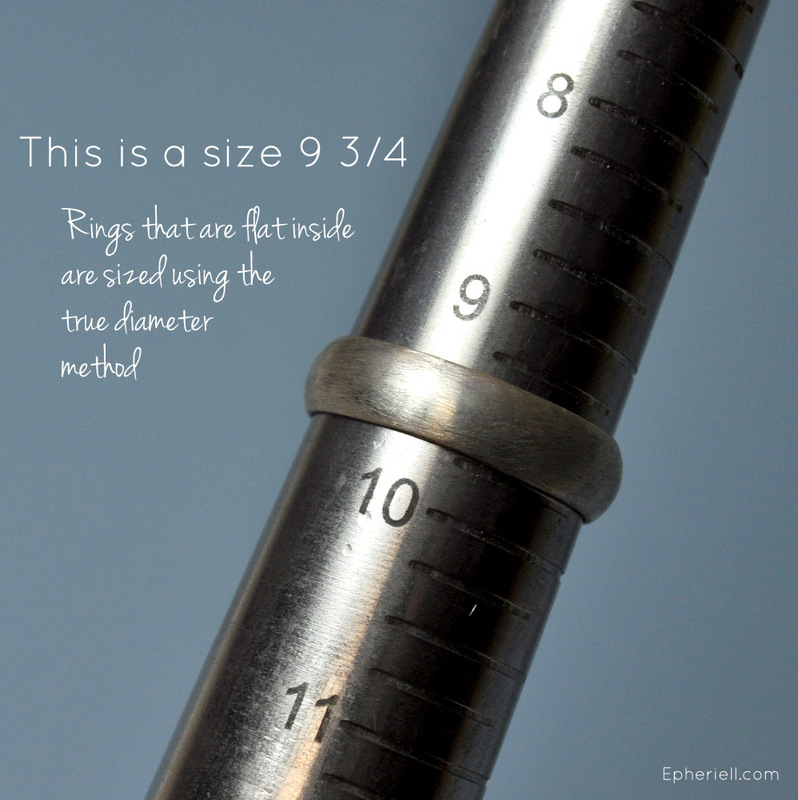 I use this method, because I believe it gives a more accurate size, as ring sizes can also be measured using inside diameter. And the point where the ring and mandrel connect is the bottom edge of the ring, not the middle. A variation to this is when I’m sizing a ‘comfort fit’ ring. Comfort fit rings aren’t flat on the inside – they’re a little bit convex. Therefore, they need to be measured by where the middle of the ring sits on the mandrel, as this is the narrowest part of the ring. Finally – ring size is never perfect 100% of the time, because we don’t have metal, never-changing fingers. No – our fingers are malleable flesh, and they can shrink and swell depending on the weather, temperature, and even what we eat or drink. Not to mention when we gain or lose a few kilos. Finally – if you’re buying a ring to wear for the first time (I’m looking at you, guys) you’ll probably think that it’s too small at first, because you’re not used to the sensation of a ring on your finger. I always recommend you give it a good 1-2 weeks of wear before you make the decision to get it re-sized, as you’ll probably find it becomes comfortable over time, and you won’t even know you’re wearing it. So, with all that in mind… isn’t it an amazing thing when your ring arrives and fits perfectly?! I try really hard to ensure every one of my customers gets a perfectly sized ring, every time – but as you can see, getting the size right is a real collaboration between you and me, as I can only go on the sizing information you give me. The more detail the better, always! P.S. I still have to get some photos of my square rings to show you how those are sized, so keep an eye out for that!